It is always a difficult decision when looking for insurance cover, who do you choose, where do you go, how much does it cost, are they reliable and do they give good service? Unfortunately, this is not always known until there is reason to make a claim, which may be too late. A couple of years ago when my house and vehicle policies were due to be renewed, I decided to use Dağli Sigorta through the recommendation of a friend and I must say that there is a lot more cover on both of these policies than previously received. Being able to deal with an English speaking representative is also an added bonus and I am confident that in the event I need help or advice, I will have no problem in receiving this in a prompt and efficient manner. At the end of the day the choice is very much a personal one! The Company was established in 1967 and to date has over 44 years of experience within the insurance industry. It started as an agency of Güneş Sigorta (a Turkish Company) which was one of the most respected insurance agencies in Famagusta, moving on to become an agent for Basak Sıgorta (now Groupama). The agency went from strength to strength, covering the whole of the TRNC, resulting in the company employing more staff to cope with demand and the increased number of agencies within its chain. 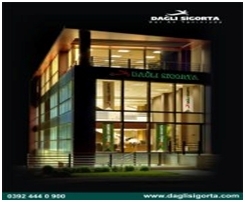 In 2001, the 15th local insurance company, Dağli Sigorta, was founded. The aims and the objectives of the Company are to have outlets covering the whole of the island, giving complete customer satisfaction. With its strong financial footing and the willingness to adapt to market change, makes Dağli Sigorta the ideal company with which to place your trust. This in turn makes us the most specialised local insurance company within the sector. When our customers suffer property/vehicle damage, speed of operation is extremely important to both the customer and the Company. Dağli Sigorta’s priority is to respond quickly in terms of analysing damage caused and making payment/repair in the shortest possible time. Dağli Sigorta is one of the top 10 largest insurance companies in North Cyprus, of which there are 28 in total (to date the results for 2012 have not been published). In the year 2012, there were a total of 20,000 insurance policies written by us and a total of over 1.8 million TL paid to meet claims made. The Company is always alert to the changing needs in today’s environment and our constant policy reviews, ensures Dağli Sigorta’s product development is the finest available, which keeps us at the forefront and at the cutting edge of the insurance industry in the TRNC. value. We are, in fact, the only insurance company to offer a two  year warranty on vehicle accident repair, damage to tyres, windscreen breakage, even a 24/7 emergency accident cover – to name but a few. Home insurance also covers a 24/7 hour service. “We are always at your side” when other insurance outlets are closed for the evening, weekends and even holiday periods, so you are never alone with our policies. If you are out of the country, we will even undertake repairs in your absence and keep you fully abreast, by email, work which is being undertaken on your behalf. With a little good fortune and a fair wind, damaged property will be completely repaired before you have even set foot back in the TRNC. We recognise that steady growth in our customer database is the future for our Company. In 2011 the Company identified a potentially large market of people who would benefit from our service. So we created an outlet on the North coast and already a significant number of people have taken up the opportunity and joined the Dağli Sigorta family of customers. Our latest addition is yet another outlet, this time in the Boğaz area and already we have courted several customers, who have taken up our insurance products. This, our latest outlet, is already showing enormous potential and will make a significant impact on our database expansion. So why not come on board and experience “excellence in service”. Thanks Dasha for your question and I will talk to Trevor and we will come back to you shortly. Thanks for your question Dasha and we will give you the information you want shortly. thank you Chris. Looking forward to it! what is the maximum cover on fully comp, is it £20000, which seems normal here? Dagli Sigorta can insure any make of car irrespective of age or price. If they fully insure the vehicle they pay out the full value of the car at the time it is written off. Dagli Sigorta is also prepared to insure a car over 10 [ten] years old, assuming they can obtain replacement parts, unlike the vast majority of other insurance companies in North Cyprus.